From a worm’s eye viewpoint Operating Expense has been observed to produce some undesirable effects too. Apart from insufficient funds to maintain the network (E.g. the increasing and unsightly hazard from rotting ex-electricity poles remaining lashed to new ones as BT can’t afford to transfer its drop wires etc.) all FTTCs are provided in initially with the minimal tie cable sets of only 100 pairs and single ducts for cabinets fitted with up to 288 ports. In Ewhurst this resulted in a delay of over 6 months when BT were obliged to falsely declare a line was too long but failed to observe the next door resident had a VDSL service down the same drop cable. Perhaps more worrying are ongoing increased energy costs of FTTC deployments. Guessing at a cabinet load with fans running at say 500 W, the consumer is presumably paying for an annual load of say 27 mWh and at a time when generation capacity is likely to be stretched. However the major concern for UK plc must be the horrible iceberg of unacceptable line performances for many of the longer line end users left in an insoluble predicament of increasingly inadequate speed and reliability difficulties. you sure do Neil, but if you don’t go the extra mile then you’ll have even more disgruntled people than you have already. Politicians still believe you are doing ‘superfast’ for over 90% but soon they will see you can’t deliver on the long lines. A little voice is crying out, ‘the emperor has no clothes’… He might be a powerful ruler with mighty armies, and undersea cables, but he’s still naked if he can’t look after the little people. So where would you expect the <10% to be? As a former BT engineer you should know this, Peter, or have access to it from your former colleagues: what’s the average line length in the UK in Market 1, Market 2 and Market 3 areas? That will give us a good idea of where the >10% is likely to be. PS. Why don’t you drop the nom-de-plume? Peter Barr isn’t the greatest disguise for Peter Barrington. Some heroic assumptions there. However, one thing that is obviously wrong is the conclusion that the resultant £350-400m revenue is all incremental to BT as a group. Firstly, a great deal of this will be offset by reductions in the wholesale charges for BT’s ADSL wholesale services as most of the VDSL customers are likely to be migrations of BT Retail customers. Further, as most of these are internal revenues (as the second graphic notes), this will only result in increased group revenues insofar as BT Retail can persuade their customer base to pay for higher speed services. There’s strong evidence that this is going to be very difficult – the UK market price is notoriously price-sensitive. Indeed, we have Talk Talk claiming BT are operating a margin squeeze on BT Inifinity retail pricing. Of course, BT will be counting on a considerable number of LLU customers migrating to FTTC services, which will result in some increase in revenue. However, you can reasonably expect LLU operators to not be overly enthusiastic about promoting fibre when they’ve got their own (sunk cost) investments to protect (they were very tardy in offering their own retail products and have hardly promoted them). Of course, they are forced to offer FTTC products as defensive measures, but I don’t expect to see expect to see them exactly embrace it. In conclusion, I’d expect any increase in group revenue to be nothing like £350-400m as much of this will be, in net terms, just BT Retail customers migrating with relatively little increase in overall revenue. It’s more of a defensive move than one which will yield enormous new revenues. For what it’s worth, I suspect that FTTC conversion will turn out to be much higher than Openreach’s current assumptions (of 20%), but it will take time. The report commissioned by Talk-Talk to make the case that BT are overcharging for GEA was based on a rather ambitious 60% conversion rate. Now this might happen (eventually), but not before 2017 when GEA wholesale charges will become open to regulation by Ofcom. Finally, of course, there are operational costs, such as power and maintenance to be paid on all these tens of thousands of active cabinets. They are full of potentially vulnerable electronics and all have things like UPS and batteries to replace regularly. There’s also a big commercial risk that the whole investment could be undermined by some revolution in communications as yet unknown. A fifteen year payback period in the world of modern communications is a long time. 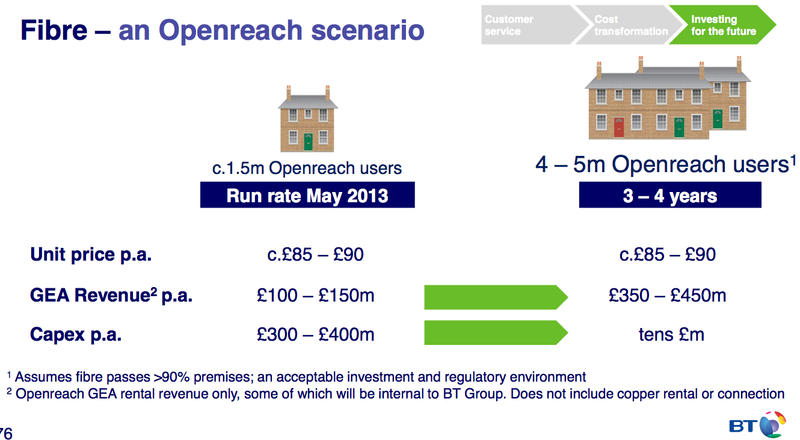 From the presentation slide, it looks like BT is expecting that £350-400m to be gross income to Openreach and therefore immune to retail pricing. 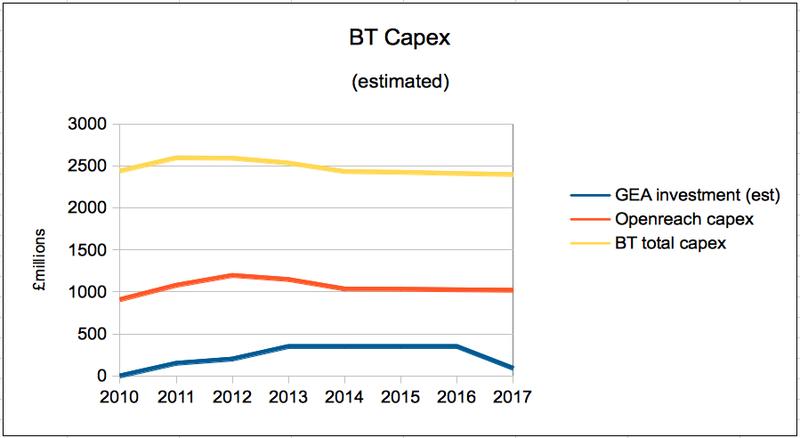 I agree that BT’s estimates of take-up are likely to prove low. It is currently running at 11%, and most of that will have been won in areas were Virgin Media has been offering a more competitive product for longer. Once Openreach makes VDSL available in areas where there is less competition, such as the rural areas, take-up will be effectively 100%, no matter who the ISP is. That may be gain to Openreach, but if it’s largely at the expense of BT Wholesale, then the net effect is much less. There can only be an increase in Group revenue from stuff they sell to external customers. That can only come from either BT Retail customers (through greater market share or higher prices) or the likes of Sky buying GEA. Hence any increase in group revenue (on the figures provided) will be nothing like £350-400m. I’m also intrigued over what you count as overheads as you make the assumption that 50% of £1.4bn spent by Openreach on GEA falls under that headline. For instance, are you including any staff costs spent on the roll-out as overhead? It just seems a very large proportion with little justification for how it was arrived at. 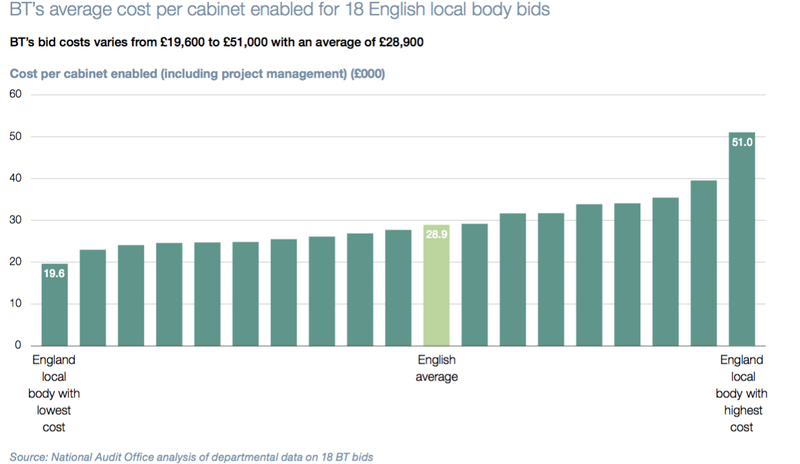 Iwade paid just under �13,000 for its cabinet and path a couple of years ago; Northern Ireland paid around that on average; the NAO says the average cost of a cabinet an path in England is �28,900, based on its study of 18 BDUK contracts. BDUK says it clawed bask at least 30% from the first few invoices it’s seen, There’s plenty of evidence that BT’s estimates of overhead and contingency provisions are spectacularly high. As to labour costs, perhaps you can tell us how much is outsourced to contractors and therefore a simple expense on the P&L, written off in the year it is incurred. BT also assumed a 20% take-up over the life of the contracts and a 12 year payback. Current evidence of take-up, which is a key driver of pay-back, suggests those assumptions are generous to BT. I’ve no idea what BT would spend on contractors on a typical cabinet deployment. However, if what you mean is contractors digging up roads, laying down cables, running mains feeds and the like, they will not be considered part of P&L. Indeed, they won’t be allowed to be part of any current account costing (they will appear over time as depreciation, amortisation and – if the worst comes to the worst – write-downs). Alternatively, if by contractors, you mean people acting as project managers and the like, I’m not sure what the tax position is, but I’d expect such costs to be considered as part of the project (that is not P&L). Contractors employed for operations are, of course, defintely part of P&L, but that’s a completely different issue. In the case of BT employees, from a tax point of view, they are current account costs. However, from a project accounting point of view, they are part of the implementation costs. Hence I’d expect Openreach to include BT staff costs associated with the BDUK NGA rollout to be part of the bid cost. (As I would the costs of any contractor costs performing the same role). As far as the income to BT is concerned, read the caveat at the bottom. It is qualified by stating that most of that increased revenue is internal. That means it counts nothing from a group point of view unless it can be realised as increased external sales (or reduced costs). Of course, if OR was an independent company, then it could be taken on its own. But, for good or ill, it’s not. The irony of course is that full separation of OR is what many want, and if this had happened, then you might well have seen BT Wholesale and BT Retail on the same side of the fence as TalkTalk, Sky and the like. Related to your story I noticed a BT shill on the Think Broadband forums (an organisation that refuses to list Kijoma) that goes by the handle of “Partial” has started to gloat about OR and BDUK money and what it is allegedly going to do to Kijoma and others like us. To think that people like him are busy gloating when the majority of the money behind it is public benefit cheques shows a remarkable arrogance to the very people that have subsidised their “success” . How many of us in business out there would feel good about being undercut for a job by a neighbour who lives on benefits ? Let alone have them gloating about it. We had a customer contact us today who has our service and a new FTTC service “load balanced” . They stated however that the reliability and performance of the FTTC is nowhere near as good as ours (this is for a large business) so their load balancer sends pretty much all the traffic our way. They had been told how great their “Fibre” was going to be and it …. wasn’t . They had the foresight not to ditch our service based on this promise and are glad they kept it. The £28,900 for the cabinet represents 36% of the bill identified by the NAO – see proportions on Table 11 P33. The PM was identified separately as part of a futher 17% cost line. There are further lines for future proofing or other solutions, and contribution to the core network. Excluding operational costs the total if the mystery future proofing is included is c £63,900 with BT having a blue light to bill c£47k in state subsidies if their invoices pass an ERDF audit. The £64k average is ok if treated at a county level. BT have not jumped on those concluding that c£1.3bn capital (cash, capitalised labour, other capitalised costs) of the £2.5bn programme provides an estimate of their fully allocated costs (minus operational costs) for passing 19m homes with c50-55,000 cabinets. This would include all their allocations for common costs, contributions to the core network. It is not unfair to conclude the £10-£14k represents incremental direct costs for cab, install, power, and connection to an established handover point. I have counted excluding Cornwall and NI – £1.156bn public cash to address a combined intervention areas of 5.3m premises, to be served by 23,000-25,000 cabinets + plus some elusive future proofing. The latter becomes somewhat academic given BT have changed the positioning and pricing of FTTP to being a premium business product. BDUK spotting Project Management savings of 35% points to £100m savings if secured across 42 contracts. This should be just the begining. Running a GEA economic model which mimics BT’s commercial rollout and making generous adjustments for network re-use, distance, repair and new duct shows a total £500m available for non-FTTC activity – the £100m is part of that. This includes the 19 submarine cables for H+I. I will publish this analysis by county once the model is peer reviewed. With BT having no particular plan for FTTP, the question arises whether the councils will spend with someone else or not all. “Running a GEA economic model which mimics BT’s commercial rollout… shows a total £500m available for non-FTTC activity.” In other words, as BT has changed its mind on FTTH, it has overpriced the Final Third contracts by £500m, or around 43% of the contracted value, excluding Cornwall and NI. I hope the NAO and PAC read this. As I understand it, BT are contractually obliged to provide the level of NGA coverage on a contract-by-contract basis. If that target can only met by using FTTP, then BT have to cover the shortfall – it’s part of the commercial risk. It’s not obvious that the increase in FTTP installation prices change that at all – it would increase the downside risk of course, but then it may be that there are economies of scale if a number of properties are FTTP enabled at the same time. The FTTP on demand prices (which are based on individual properties) may not therefore be a good guide to a change of mind by BT as regards the use of FTTP to meed the contracted NGA targets. I don’t know for sure that FTTP on-demand prices won’t be used in the BDUK contracts, but I think it’s very unlikely as (for reasons mentioned above), I’d expect “actuals” to be used. Of course, it may be that FTTC will meet a higher proportion of the NGA coverage than in the bids (so less FTTP requirement), or fibre-to-the node will be substituted. However, I’m not sure that it can be concluded that BT have changed their mind with regards to the use of FTTP in respect of the BDUK contracts. One thing that is unclear to me is if any savings (or claw-backs) for that matter can only be spent against the BDUK framework contracts (where they’ve be signed), or if the counties can spend any surplus with who they want – like altnets. Without recourse to the detail of the contracts, then I don’t know. Incidentally, according to Thinkbroadband, the increase installation costs for FTTP on demand came about as a result of OR’s experience. The actual numbers don’t surprise me – I think it’s the penalty of installation one site at a time. In my case, I’m 500m (radial) from the cabinet and I know that my copper loop is simply buried with a Y connection under the pavement (as 15 months ago, it had to be dug up as after 40+ years the the waterproofing failed). I’ve no idea how much of that 700m of actual cable length to the cabinet is in conduit, rather than simply buried, but if the latter is significant, then that’s going to be fearsomely expensive. Of course, this is not necessarily indicative of all installations, but I suspect there’s lots of unpleasant surprises given the age of much of the network. No doubt that (as Andrew Ferguson concludes), the full cost isn’t charged to the first customer, but it has something of the ring of truth about it.